9th Ward aldermanic candidate Cicely Fleming speaks in University Hall (left). The other candidate, Shawn Jones, speaks at an aldermanic forum earlier this year (right). Two 9th Ward aldermanic candidates are vying to replace Ald. Brian Miller (9th) in a race focused on addressing affordability and equity issues in Evanston. 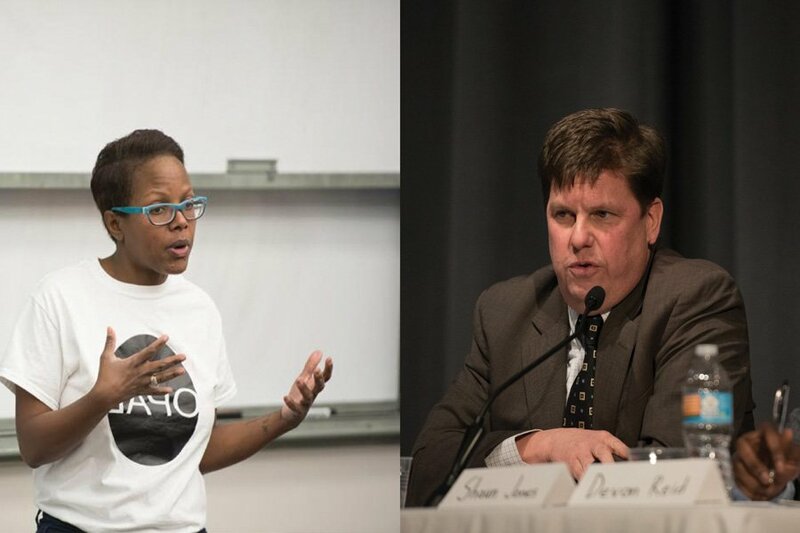 Shawn Jones, a lawyer and former reporter for Evanston RoundTable — a community newspaper — is facing off against Cicely Fleming, an Evanston native who co-founded the Organization for Positive Action and Leadership, which works for equity in the city through civic engagement. Miller, who has held his seat since 2015, is not running for reelection after an unsuccessful bid for mayor. He finished third in February’s mayoral primary, which featured five candidates, the top two of whom advanced to the April 4 general election. Fleming said she was motivated to run for political office after feeling frustrated with some of the decisions City Council has made over the years, particularly the many fees and taxes Evanston imposes, which she said can act as a burden on residents. She pointed to the tokens and fees required to access city beaches. Fleming also expressed concern with the fees required, for example, to register a dog with the city and taxes that 9th Ward residents pay to maintain the Ridgeville Park District. Fleming, who has received an endorsement from Evanston Firefighters Local 742, said she would propose working with other aldermen to review fees in the city and see where cuts or changes could be made. Jones said he is running in this election “out of a sense of responsibility” after experiencing, learning and hearing about issues while covering City Council meetings for Evanston RoundTable for eight years. After growing up and living in Atlanta, Jones, who has been an attorney since 1997, moved to Evanston in 2008 and now runs his own law firm in downtown Evanston. Jones, who received Miller’s endorsement, said he also recognizes the high tax burden in Evanston and would address issues of affordability. He suggested permitting the construction of “micro homes” in each ward, which he said are small, modular structures that could be built four to one lot. He said he would also expand the city’s existing roommate match program, in which residents who need a place to live can move in with families in financial trouble to help with rent or housing costs. “Having worked directly with people who are losing their homes to foreclosure or eviction, I have seen or stared into the faces of people who are being put out,” Jones said. Miller said he endorsed Jones for his work at Evanston RoundTable exposing “waste, fraud and mismanagement,” and “police issues” across the entire city. Jones and Fleming both discussed the need to address issues of equity in policing. Fleming said OPAL has worked to push City Council over the years to address the use of stop-and-frisk procedures by the Evanston Police Department. She pointed to a report that showed EPD officers were seven times more likely to search black drivers than white drivers in 2014 as evidence for the need to address police conduct. “That (report) is a direct result of the decision that our City Council made to increase our stop and frisk procedures without thinking of how those (procedures) are going to affect people of color,” Fleming said. Jones said his law firm was the first group to submit a Freedom of Information Act request in December 2016 for the release of the video showing the arrest of Northwestern graduate student Lawrence Crosby. The request was not successful, Jones said, but Miller facilitated the video’s release a month later. Jones also said he would work on amending ordinances to improve police accountability in Evanston. “We cannot be saddling our citizens with arrest records when they really did nothing wrong,” he said. The two candidates will face off in Tuesday’s general election.